Place racks in lower third of the oven. Heat oven to 375°F. Unroll and press 1 of the crusts in bottom of 9-inch glass pie plate so it lays about 1/2 inch beyond the edge of the pie plate. Coat crust with beaten egg white. Dot the bottom of the crust with 2 tablespoons small butter chunks. Make the filling. In a medium bowl, sprinkle the lemon juice over the apple slices. Combine the cinnamon, nutmeg, tapioca pearls, cornstarch and salt together with the sugar. Gently toss the apple slices and raspberries with the sugar mixture. 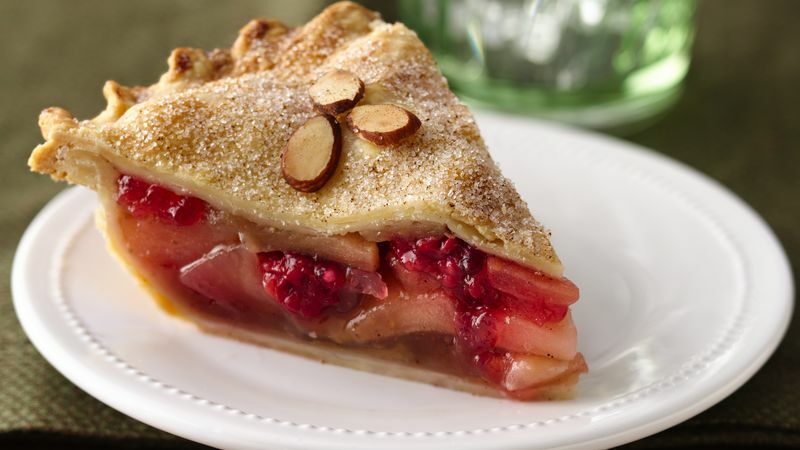 Put the apple mixture into crust-lined pie plate and mound it slightly in the center. Sprinkle the amaretto evenly over the filling. Distribute the remaining 2 tablespoons butter chunks over the top. Brush the top edges of the dough with egg white. Place the second pie crust over the top. Fold the top layer of dough under the edge of the bottom layer and press the edges together to form a seal. Flute the edges as desired. Brush the top crust lightly with the egg yolk mixture. Place almond slices in decorative fashion on top. In small bowl, mix 1 tablespoon sugar and 1/4 teaspoon ground cinnamon. Sprinkle over pie. Pierce the top of the crust in several places to allow steam to escape while baking. Place pie in oven; place sheet of foil on rack below pie in case of spillover. Bake 50 to 60 minutes or until the crust is golden. Cool on a rack before serving. The pie keeps well at room temperature, covered for 24 hours, or refrigerated for up to 4 days. If you don't like amaretto, substitute apple juice or water in its place.